So here’s a scenario. You’re in your electric car in the future, rushing from Austin to San Antonio for an important meeting, and you realize your Tesla’s running out of juice. Do you pull over and wait for it to charge at some middle-of-nowhere station and lose valuable time in the process? Of course not! You’re from the future, silly. 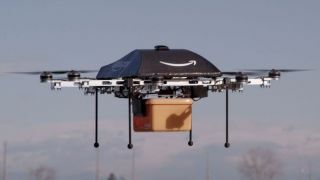 You just contact Amazon, which then sends out a drone that lands on your car and starts charging it while you’re still barreling down Interstate 35. Yes, this is still TechRadar: you didn’t accidentally click over to SyFy. But as implausible as this scenario sounds with current technology, the oddball idea at its heart is the subject of an actual patent that was recently granted to Amazon. As described in the patent, after you call it in, the drone shows up at a specified rendezvous point and finds your car by identifying some kind of marker on top. It then lands and does its thing. The patent comes with multiple illustrations showing how this might work, with some depicting docking stations that retract or leave permanent clamps on the tops of cars. It’s worth noting that even if the logistics were somehow realistic with current technology, you still wouldn’t get much out of a charge. The technology just isn’t there yet. But, even a boost of 10 extra miles might be helpful, particularly if you’ve been stuck in a traffic jam that’s been using your battery less efficiently than you might wish. For that matter, we’re talking about current electric cars. Amazon first applied for the patent back in 2014, which essentially feels like eons in the past in terms of electric vehicle development. Who knows, though? It wasn’t too long ago that many of us who couldn’t imagine toting entire computers around in our jeans pockets. As always with patents, though, keep in mind we may never see anything like this in the real world. As far as we know, Amazon has no plans to make electric cars itself.